Update July 2013: a new Centenary project for the Butte . The Butte de Warlencourt, a prehistoric burial mound on the side of the Albert to Bapaume Road, was, during the 1916 Battle of the Somme, a position of great strength for the Germans. It was fortified with barbed wire, riddled with tunnels and defended by machine guns and mortars and stood as a sentinel in front of the major German trenches called Gird Trench and Gird Support. For most conspicuous bravery and good leadership in attack, whereby he saved the situation on the right flank of his Brigade and of the Division. Lieutenant-Colonel Bradford's Battalion was in support. A leading Battalion having suffered very severe casualties, and the Commander wounded, its flank became dangerously exposed at close quarters to the enemy. Raked by machine-gun fire, the situation of the Battalion was critical. At the request of the wounded Commander, Lieutenant-Colonel Bradford asked permission to command the exposed Battalion in addition to his own. Permission granted, he at once proceeded to the foremost lines. By his fearless energy under fire of all description, and his skilful leadership of the two Battalions, regardless of all danger, he succeeded in rallying the attack, captured and defended the objective, and so secured the flank. For much of the rest of October 1916 various British Divisions were rotated through the trenches overlooked by the Butte. An attack towards the Butte was made on 7 October when the village of Le Sars was taken. It was not until 5 November that an all out effort was made to take the Butte. This was undertaken by the 7th, 8th, and 9th (DLI) of the 50th (Northumbrian) Division. 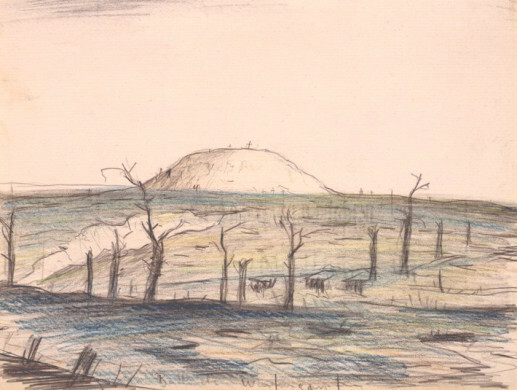 "...the BUTTE DE WARLENCOURT had become an obsession. Everybody wanted it. It loomed large in the minds of the soldiers in the forward area and they attributed many of their misfortunes to it. The newspaper correspondents talked about 'that miniature Gibraltar'." Other than its brief capture by the DLI, the Butte remained under German control throughout 1916. It was not until the German retirement to the Hindenburg line in February 1917 that the Butte passed into British hands. Within weeks wooden crosses had been placed on the top of the Butte in memory of the Durham soldiers who had died during the previous year's attacks. The crosses were removed in 1926 and placed in Chester-le-Street and Bishop Auckland parish churches, and Durham Cathedral, where they remain to this day. Image courtesy The Trustees of the National Library of Scotland. 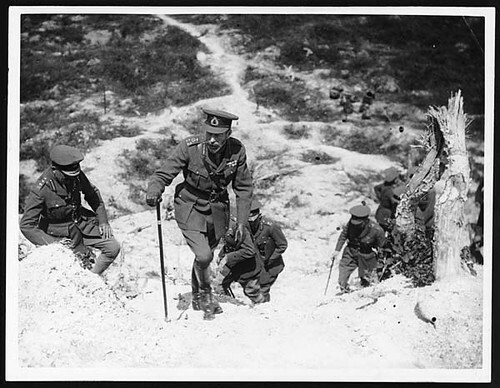 King George V climbing a large mound known as the Butte de Warlencourt. He is followed, in single file, by a number of other uniformed men. Although there is no date attached to this photograph, it is known that the King visited the Butte in July 1917 - a likely date for this photograph taken by the British official photographer, John Warwick Brooke. The Butte de Warlencourt marks the very limit of the British advance on the Somme and as such is as symbolic as the Lochnagar Crater in La Boiselle, not very many miles down the road. 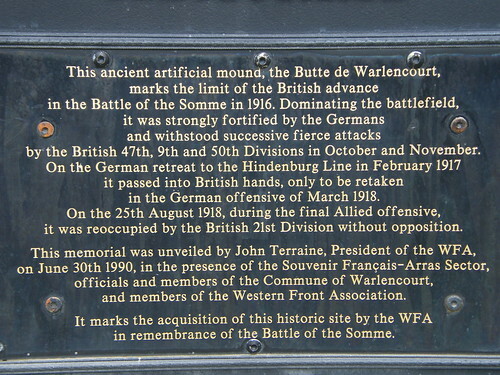 In 1990, to ensure the Butte could be preserved for future generations, and in remembrance of the Battle of the Somme, The Western Front Association took the decision to purchase the Butte. Trees, which had covered the views from the Butte, were cut down or removed and a WFA memorial was erected. That ghastly hill, never free from the smoke of bursting shells, became fabulous. It shone white in the night and seemed to leer at you like an ogre in a fairy tale. It loomed up unexpectedly, peering into trenches where you thought you were safe: it haunted your dreams. Twenty- four hours in the trenches before the Butte finished a man off. The Bulletin continues, "This low mound became a symbol of the Battle of the Somme, and for those who gathered there 74 years later it is still a powerful symbol despite the tranquillity that now surrounds it." One of the most famous locations on the 1916 Somme battlefields was the Butte de Warlencourt, an ancient mound dating from Roman times. Continuing from Warlencourt British Cemetery along the D929 towards Albert, the Butte is located to the left of the road and up a hill. The position of the Butte is often not at all obvious from below when the trees foliage is thick and obscures it from view. The Butte is also smaller today than it was before the First World War. Tunnels were made in the mound, and due to it's excellent observation potential it was fiercely defended by the German, surrounded by barbed wire and strengthened with machine guns. There are signs outside which remind you of the status of this site; the bodies of soldiers who fell will still remain here. The Butte was held by the Germans and not taken by the British during the 1916 Somme Offensives, although on the 5th of November soldiers from the 50th Division did reach it briefly. The British only gained it when the Germans abandoned this position in their 1917 retreat to the Hindenburg Line. However, the Germans took it again when they advanced again in spring 1918. The 21st Division took the Butte again on the 25th of August 1918. Once inside the site, a path with concrete steps set into it leads up to the top. A plaque attached to a tree remembers men of the Post Office Rifles (the 8th London Regiment) who fought and died here in October 1916. From the summit there are excellent views, although again this can be limited by the foliage present. A cross made up of stones is inset into the ground. Several battalions of the Durham Light Infantry, as well as their parent brigade (the 151st) erected battlefield memorial crosses here, but these were taken back to Durham in 1926. The Butte is now owned by the Western Front Association, who purchased it in the late 1980s, and there is a memorial plaque ertected by them on the top. Extract courtesy World War One Battlefields. Image copyright © courtesy of the artist's estate/ The Bridgeman Art Library from the British Council. Image courtesy AWM, made by an unknown Australian photographer on 3 March 1917. 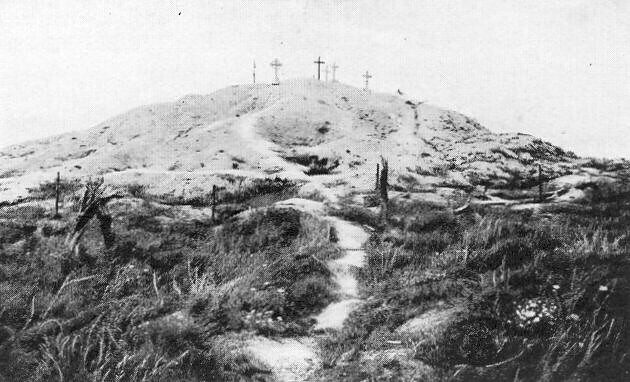 The north west side of the Butte de Warlencourt, near Le Sars, France, as it appeared on 3 March 1917, showing on the left the remains of a belt of heavy wire that stretched to the Albert-Bapaume road. Advancing by night from north of Le Sars, the 20th Battalion, AIF, took this position after overcoming the slight opposition by the retiring enemy. Men of the 2nd Australian Division taking up bombs to the forward area by light railway; in the background is the Butte de Warlencourt, March 1917. You can view a slideshow of some of the images above, including Medal Index Cards, beow. Please use the ''expand'' icon to enlarge to full screen; pres ''Esc'' on your keyboard to return to this page.